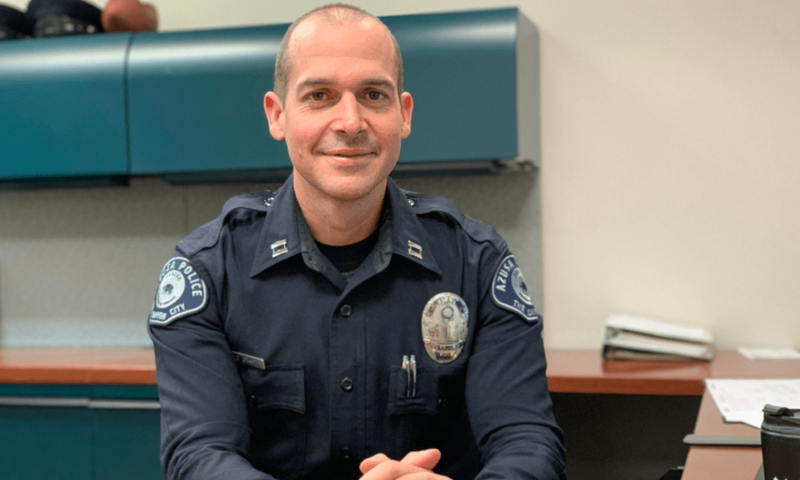 Captain Christopher Grant, who currently serves as the operations division captain, began his career as a police officer trainee with the Azusa Police Department upon his completion of the Rio Hondo Police Academy in 2006. As his career has progressed, he has held numerous positions and been assigned multiple collateral duties within the department, to include: field training officer, field training coordinator, SWAT operator, SWAT team leader, SWAT commander, special enforcement team detective, special enforcement team sergeant, detective bureau lieutenant, patrol sergeant, patrol lieutenant, gang unit supervisor, HALO supervisor, drone program coordinator, and Golden Days Parade liaison. Prior to beginning his career in law enforcement Captain Grant taught high school history and coached baseball. Having grown up in Southern California, Captain Grant received his Bachelor’s of Science Degree in Sociology from the University of Redlands, where he also competed in baseball. Captain Grant also has a Master’s of Arts Degree in Organizational Leadership from Woodbury University. During his time as both a detective and sergeant with the special enforcement team, Captain Grant was an early and instrumental proponent in developing the department's relationship with federal task forces, allowing for the development of advanced technological and investigative approaches to narcotics and weapons cases. The evolution of the investigative unit has continued and today, with the special enforcement team serving as a collection of motivated detectives dedicated to combating quality of life issues at both the state and federal levels. Captain Grant remains a proponent of community outreach and regularly attends proactive information-sharing gatherings in the community. He firmly believes that communication between citizens and the police force not only allows residents a better understanding of the agency, its methods, and current issues facing the city but also provides a means for the agency and citizens to work collaboratively to make Azusa a safer city. Captain Grant is the proud father of three beautiful children. An avid lover of sports, nature and the outdoors, Captain Grant spends his free time hiking and competing in long-distance runs. His commitment to the Azusa Police Department and the citizens of the city of Azusa, as demonstrated by his previous accomplishments, will continue to flourish as he remains dedicated in his service.